Bobbi Brown launched her Beach fragrance in 2002, and it has been a best seller for the brand since then. The notes include summery sand, jasmine, sea spray, dianthus dune flower, neroli petals and driftwood. Bobbi Brown Beach isn't a tropical sort of beach fragrance, like J Lo's Miami Glow or Matthew Williamson's eponymous scent; it smells like an Atlantic beach vacation (East Coast of the US, to be more exact): a bit of fresh sea air, a bit of salt water, and the very synthetic smell of sunscreen. The opening is a wee bit sharp, and rather reminiscent of some of the sunscreen sprays that have suddenly become popular at my own local pool this summer, but it settles nicely. I have seen the smell compared to Coppertone, and it does have something rather Coppertone-ish about it, but it isn't the dead ringer for Coppertone that is At The Beach 1966 (see below). I have said before that I'm not a huge fan of beach fragrances. I do like Comptoir Sud Pacifique's Aqua Motu for the simple reason that it reminds me of the beach in California where I used to live, but I don't generally love ozonic or marine notes, and I'm not dying to smell like suntan lotion. That said, if you do want to smell like suntan lotion, Beach is a good choice: it isn't overly heavy or sweet, and it does have something very cheerful and summer vacation-like about it. It doesn't last long, but then, neither do summer vacations. At the Beach 1966 is a 2005 launch from CB I Hate Perfume, and was the first fragrance in the Secret History line. The scent features notes of Coppertone (the circa 1960s version), North Atlantic salt water, wet sand, seashells, and driftwood. Even more than Bobbi Brown's Beach, At The Beach 1966 is an exercise in nostalgia. I should start right off by admitting that I don't have the kind of olfactory memory that would allow me to determine if the rendition of Coppertone circa 1966 is accurate, but it certainly is immediately recognizeable as Coppertone, and this version of a summer beach is appropriately soft and hazy and filtered by memory: it has less of the overtly synthetic edge that makes up Bobbi Brown Beach, and more of the rest of the beach — the sand, the water, the boardwalk. It is, simply put, a great scent, and very much worth trying. I have a feeling that I will reach for it frequently this coming winter. All the same, I must confess that I like CB I Hate Perfume's Mr. Hulot's Holiday a bit more. Call me crazy, but I'll take a stroll along a beach in the south of France over a stroll along the Jersey coast any day. And now, appropriately, I am off for the beach. Next week, Angela will be doing a week-long series on building a fragrance wardrobe. 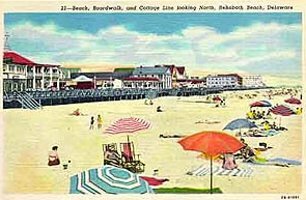 Note: postcard of the beach at Rehoboth, Delaware via rehoboth.com. Great comparison! I just recently tried At The Beach, and, of all the beach scents out there, it's the best. Fire Island doesn't even come close. Enjoy your vacation! I hope you have a great vacation, R! It is really a great scent. I love that it smells of the sea without a huge fresh marine note…I always feel like marine notes tend to take over everything else in a fragrance. I liked BB Beach a LOT, then the last time or two it has smelled hugely, harshly synthetic to me… have no idea what changed. I still want/need to try At The Beach. I really enjoyed the CB Beach. It really captures something special, even if I've not personally experienced that something. It's just a neat, very neat, fragrance. And fun! There's nothing overly serious in it to distract from the fun of it. I'm still flummoxed over Mr. H, and still can't decide whether I like it or dislike it or whatever… I think I might take everyone's advice and get it as a room spray, because I think I”d like it to linger in the air even if I can't wear it. Hope you have fun at the beach, enjoy your vacation! Thank you M! It does smell synthetic, but I think of that as part of its authenticity…I mean, suntan oil smells synthetic. But the first minute or two is rather harsh. K, Surprised, would have guessed you would like MHH better than ATB. I love all the water formulas, because really you can use them either way (room or person). I do, anyway. This is a very American scent. Can you see any French woman wearing this? The concept reminds me of all those Calvin Klein fragrances. I have tried it…because the smell does bring back those Coppertone memories by the pool. All I can say is the flies really seemed to like it. Agree it is very American, although oddly enough, the entire Clean line apparently sells very well overseas! At The Beach–I love this stuff! I grew up in a beach town and had my first kiss under the pier in 1969…a young surferboy slathered in Coppertone. A cold, salty kiss. I now work at the library just a few blocks up from that pier, and I have worn this scent to work a few times…people love it. Bobbi Brown Beach is a guaranteed mood elevator for me. I was so intrigued after reading the description of CB Beach, I ordered a sample, hoping it would perhaps be even closer to the true “suntan lotion” experience (wasn't called sunscreen in '66). Alas, not only does it not smell like my memories of 1966 Coppertone and the beach, it has a cheapness that resembles spray deodorant or certain hand creams. I just realized the postcard scene above is of Rehoboth Beach, where I frolicked as a kid in 1966. Yes, it smells like Coppertone, but it makes me happy. Because the scent is so – creamy & basic, it layers well & wears well in the hottest weather – which is what it is meant to do. I prefer the body oil and the lotion – I’m kind of obsessed with the body oil, actually.